POS in the earlier days was a mere printed receipt of cash paid against items purchased. From there, POS has now evolved to an advanced electronic system comprising hardware and software. Apart from having an efficient online POS system, keeping customer data secure is of critical importance to businesses. NetSuite, world's leading cloud business management suite, fulfils instore retailing needs of multi-channel and multi-location retailers with a POS solution that helps them streamline and accelerate transaction processes, on the one hand, and on the other, deliver consistent and personalized customer service. The NetSuite POS provides customers an omni-channel retail experience which in turn builds customer loyalty to the brand. The cross channel inventory visibility and order fulfilment ensures that the retailer does not at any point of time lose a sale due to lack of stock or absence of service personnel at a location. NetSuite supports businesses in extending Sales and Service with Mobile POS - through a smart phone, tablet or any handheld device. Just as customers enjoy order fulfilment from any location, retailers can engage and convert customers from anywhere. Sales and service is on-the-go thus avoiding delays or communication gaps. Sales persons can conduct transactions, secure payments and record customer data through their mobile device. With the mobile device, they can review customer information, perform item lookups while on the sales floor, determine quantity on hand and even locate out-of-stock items in order to “save the sale.” NetSuite POS enables you to get closer to your customer and deliver a shopping experience they will remember. With payments being processed online, possible frauds are minimized due NetSuite POS’ multiple levels of security for cashiers and managers. The integrated payment processing also helps in quick checkout for customers; long lines at checkout counters are now a thing of past. With all these benefits, that helps save time and effort productivity is bound to increase. NetSuite POS is user friendly with an easy-to-use and intuitive touchscreen interface. Sales and service professionals are now in a comfortable position to deliver improved and personalized service to the customers as they are equipped with a 360-degree customer view. Leverage data from across your business to gain necessary insights to deliver consistent personalized service, build customer loyalty and increase revenue. 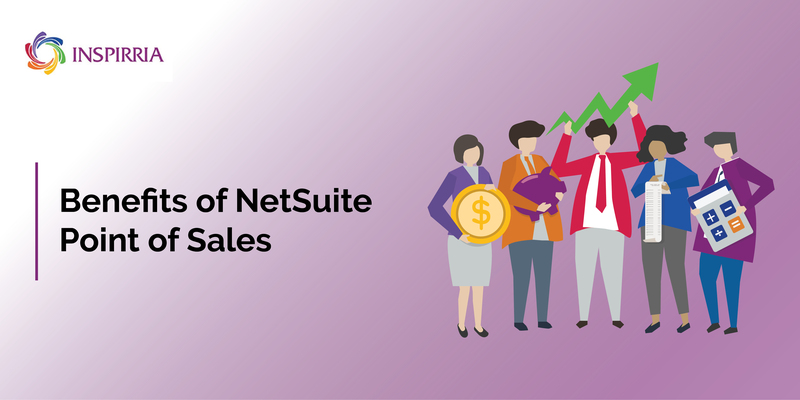 Acquire NetSuite POS, your true business partner. Get in touch with Inspirria, NetSuite’s technology partner for more information.